1. Home Edition: Which is FREE for Home Users. 2. Professional Edition: Which is the Paid version. In Avast there are in general 8 different parts(7 in home edition) know as providers.
. Internet Mail. It checks incoming and outgoing e-mail messages processed by clients other than MS Outlook or Exchange, such as Outlook Express, Eudora etc. Again, it will refuse to accept or send a message containing a viral code. Script blocking. It checks scripts contained in the web pages you look at, thus avoiding infection due to potential bugs in your web browser. (Not available in Home Edition). Instant Messaging. It checks the files downloaded by common communication programs, such as ICQ or MSN Messenger.
. P2P Shield. 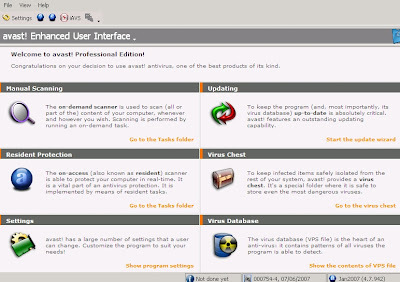 It checks the files downloaded by common P2P (file sharing) programs, such as Kazaa and others. Web Shield. It protects the computer from viruses during the common work with Internet (browsing, downloading files, etc.). It can also block access to specific web pages. 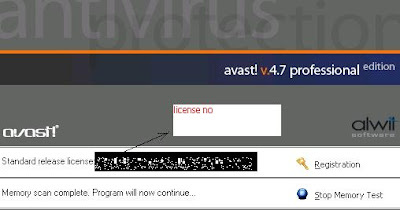 Password Protection: Avast provides password protection so that only you can make changes to the program. 1. Home Edition is free which gives a good level of security. 2. Scanning is faster than most other antiviruses. 1. If you use password protection and forget the password , you will be asking for trouble so don't use it. 2.When a virus is found Avast makes a noise like a nuclear reactor alarm which is quite irritating when you are watching some movie. (of course you can change it).